It is indeed better to add a fence around the pool because this will ensure safety for those using it- especially if you have kids. But aside from being safe, your pool’s look will surely be enhanced! It can also allow unobstructed views to the landscaping around it. You can also see other areas near it clearly because of the glass fence. 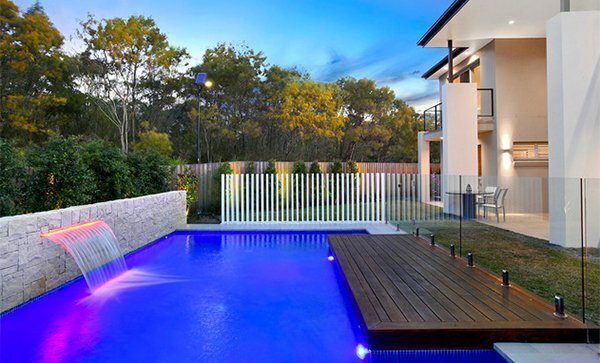 This modern pool has a glass fence around it enhancing its beauty. Ceramic tile in a royal blue adds a classic touch to it but still it retains the modern look! 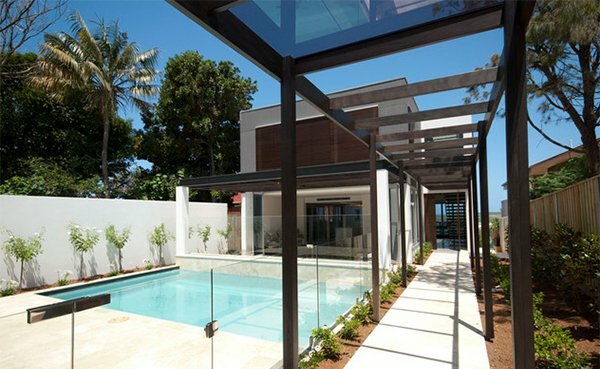 Take a look at how the glass fence adds elegance to this pool area. This is indeed a paradise in an urban setting! 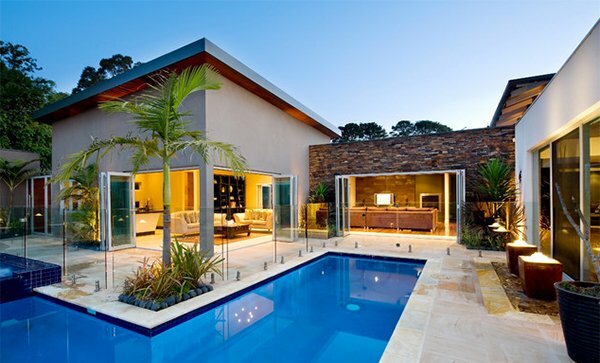 A rectangular pool outside this lovely home is like a symbol of a good life making your own home seems like a vacation home. 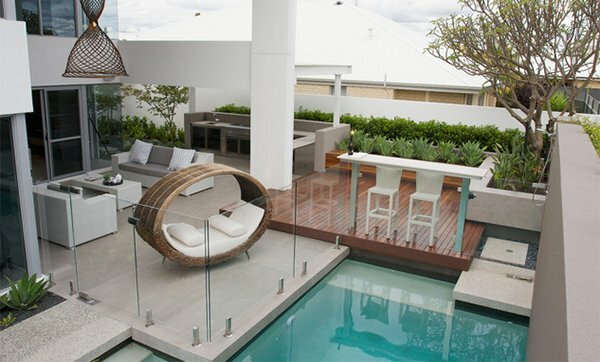 Split level timber deck upgrades the sense of beauty of the pool. Retaining wall, lighted waterfall weir, pool lights and the glass fence- all these made this pool look totally dashing and inviting! Tiling of this pool was really done pretty well! The use of glass fence is another good design taste. No wonder this pool is so beautiful because it is made by an award-winning designer, the 4blue. 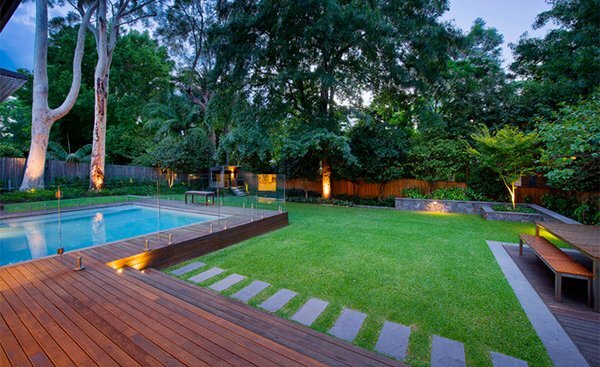 Using wood for the pool deck matched it well with the glass fence and the grass around it. The landscape is also very well done as it used stones for the planters add well as for the walkways. One look at this pool area made us fall in love with it! 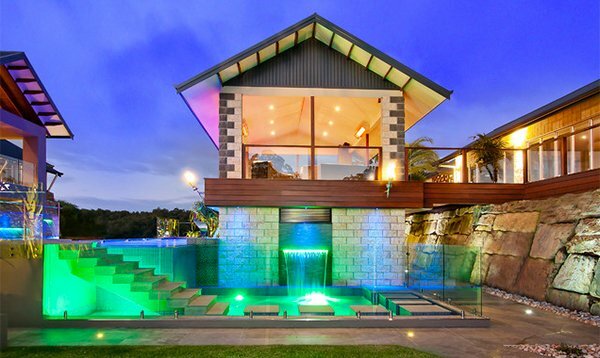 The combination of materials and landscaping is just superb! 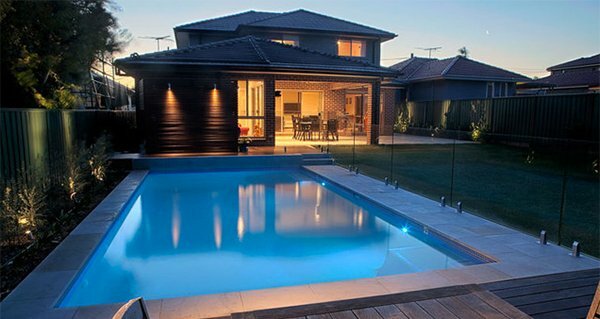 Another design that we love because of its pool lights and the use of bricks on one side of the pool area while having glass fence around it. Another thing that made this pool area look stunning is the design of the balcony above. Frameless glasses with stainless steel spigots unobstructed the views to this pool and complement with its design really well. You can see the spa portion which signals that the pool area looks as lovely as this one! Look at the design of the pool here! A lap pool that has a round pool at the end! Isn’t it lovely? 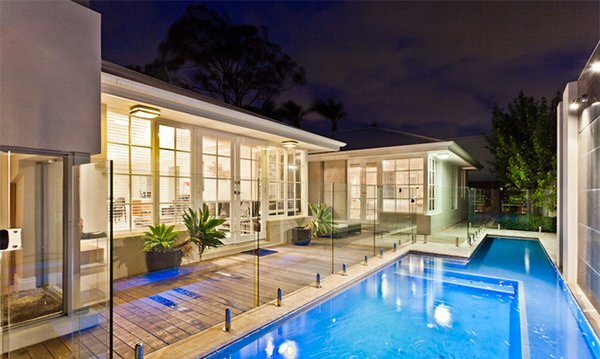 The pool is surrounded by a glass fence from end to end. 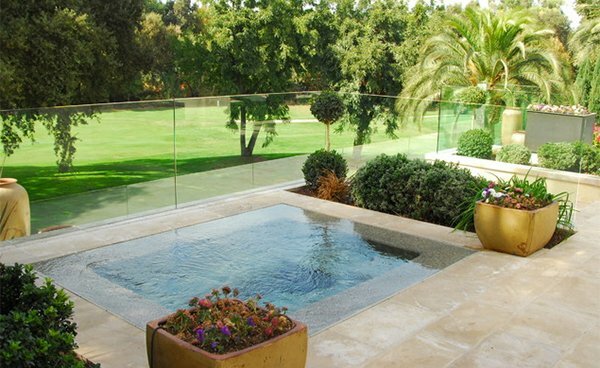 This glass fence allows the homeowners to see the patio while on the pool. The lights in pool seem like inviting us to get into it! What is your first impression when you saw this pool? Well, we are sure you loved the look of the waters! 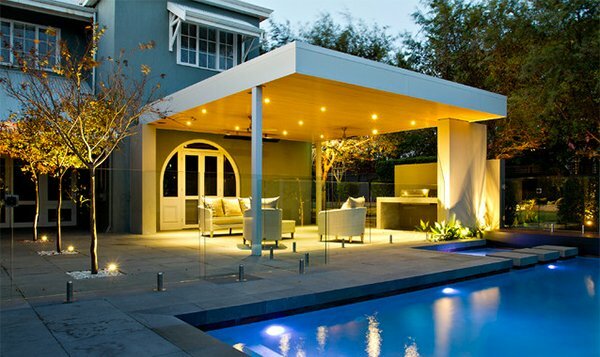 With the glass fence around it, the pool is secured while adding appeal to the outdoor scene. With the goal to create a formal garden that would capture the hearts of many, this area was built with a pool giving the outdoor rooms a calming view. 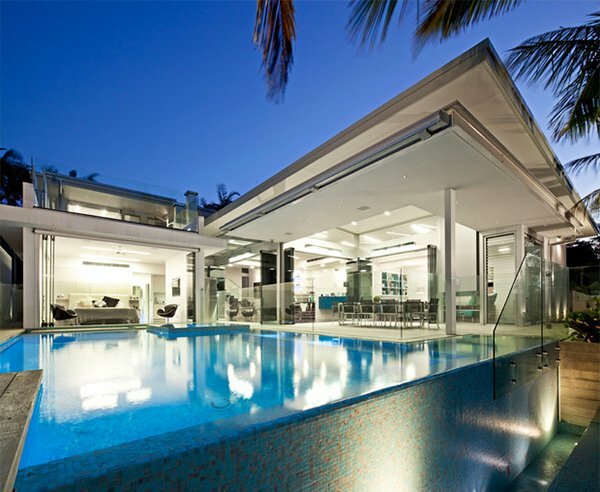 A stunning pool area that is perfect for a night party! And when we talk about a night party, the area has to be safe to avoid accidents while on the deck. 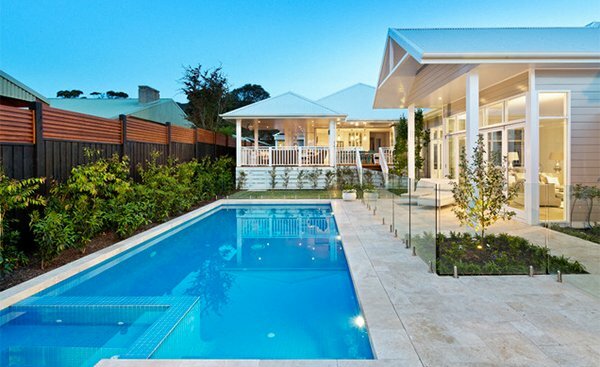 You can see how a glass pool fence could make a huge difference to the pool areas shown above. It certainly enhances their beauty making them look a lot more inviting while ensuring security for those who will use it. But if you do not want to use fences around you pool, you can always leave it at is or you can add a pool enclosure. But of course, a pool enclosure is more expensive but it would allow you to use the pool anytime of the day in whatever kind of weather! It becomes more organize and will avoid getting dirt from the grass while using the pool.And this will really help the parents to assure the safety of their kids. double purpose,securing while emphasizing the real beauty of the pool. Thank you for the suggestion Kareen it’s very helpful.